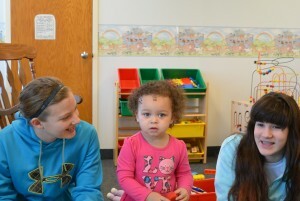 Mennonite Church of Normal provides Sunday morning child care for children from birth through kindergarten during worship, and for birth to age 2 during the Christian Education hour. This way parents are able to participate fully in the worship service and CE, knowing their little ones are in a positive, safe, and caring environment to play and interact with other children and adults from the congregation. Preschoolers are invited to participate in the Children’s Time at the beginning of worship before joining the Preschool Nursery for the remainder of the service. Our nurseries are professionally staffed by the Nanny Agency and ably assisted by volunteers from the congregation.